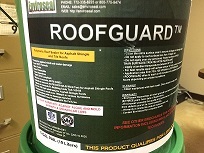 Roof Guard can be used on Clay or Cement Tile Roofs. Protect against mold, mildew and Algae. Applying RoofGuard: For optimum performance and durability apply a second coat after first coat has thoroughly dried. Drying Time: Usually 1 to 4 hours. Wind,temperature, and humidity will determine actual dry time.